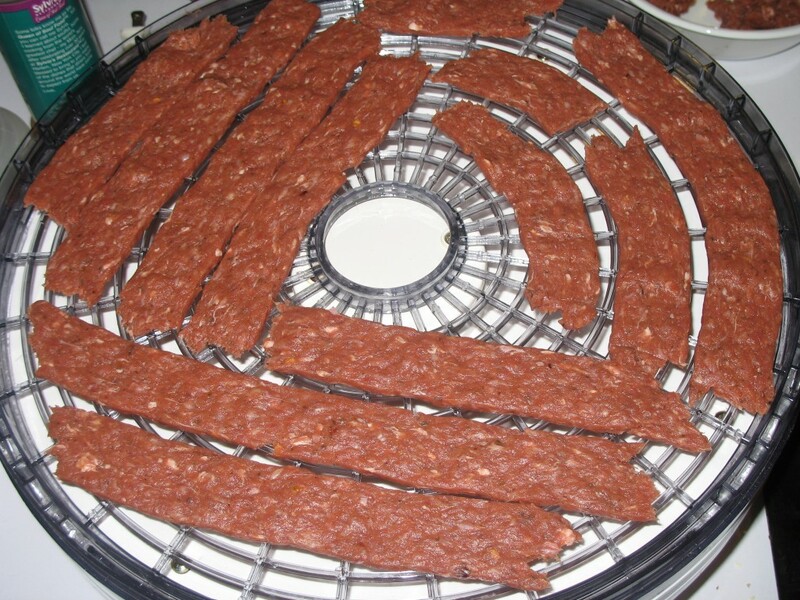 Pictured: Hamburger jerky in tray ready for drying. Meat candy. Chewy fun. More deliciousness in a bite than is almost legal. Almost. One of my frustrations as I stalk through stores looking for a snack is eying delicious jerky, knowing it cannot be mine. At anywhere between 2-7 grams per miniscule serving, the carb cost is just too high, and for someone like me, even with a semi-normal blood sugar (hey, something about me has to be normal), the added sugars and chemicals caused me to starve afterwards, accompanied by the oncoming cravings. When did beef jerky stop being all about the beef? You’ll be pleased to note your jerky can be ingredients you can pronounce and enjoy, with flavors you’ll come to appreciate. Into saving some money? Good, because each pound of $3.50 grass-fed Laura’s Lean Ground Beef (8 ounces post-drying)nets more than twice the standard amount of jerky (4 ounces), for one third of the price ($1.75 per 4 oz, versus $5). Sink your budget-lovin’ canines into that, o carnivore friends. Following are my favorite beef jerky recipes for use in a conventional food dehydrator or oven, using ground beef and a jerky extruder. Mix hamburger with seasonings until well blended (I use my KitchenAide mixer with the dough paddle) about 1-2 minutes. Using an extruder, pipe jerky onto trays. Food dehydrator: Let dry for 6-7 hours or just before meat snaps in half. Practice with this method will show that you can dry slightly less than the snap-point for more tender jerky. Oven: On the lowest setting possible, and with the door ajar ever so slightly, let dry on racks for or until meat is close to breaking when bent in half. Store in a Ziploc bag. Each pound makes 8 ounces of dried beef jerky. The beauty of this method is that the carb count is 0, and your caloric count is only as high as the amount you consume of, essentially, only ground beef. Mix hamburger with seasonings until well blended (I use my Kitchen-Aide mixer with the dough paddle) about 1-2 minutes. Mix hamburger with seasoning until well blended (I use my KitchenAide mixer with the dough paddle) about 1-2 minutes. Oven: On the lowest setting possiple, and with the door ajar ever so slightly, let dry on racks for or until meat is close to breaking when bent in half. ***Please note that all raw hamburger carries the risk of e coli when not cooked to 170 degrees Fahrenheit prior (or post) drying. *For more info: I used Grill Time Seasonings which is a Kroger store brand. Scout your spice aisles for your favorite flavors. **Tip: Serving size for the pre-mixed store spices tends to be 1/4 tsp. Keep this in mind when calculating carb counts. I tend to count .3 carbs per 1/4 tsp (4 carbs per Tbsp), for roughly 8 carbs for 8 ounces of beef jerky. I made this but I don't have a jerky thingie so I rolled the ground beef between two sheets of parchment paper and transfered to the dehydrator. Anyone can make this yummy goodie!! Okay so I am a little confused. If you are dehydrating raw meat, does that make the icky germs and possible ecoli go away? I kinda assumed regular beef jerky was cured in something…lol. Also is it possible to do this if you don't have a dehydrator? Hi, Danielle. Drying does not get rid of e coli in hamburger, even if it's grass fed. I've never been sick due to eating raw grass fed beef, but it's the kind of risk you take drinking raw eggs. You might get sick, and you might not. Some do irradiate the ground beef prior to drying in the microwave, but I've never tried this method. You can dry meat without a dehydrator. Lex Rooker (I believe) shares how to dry meat in a box on his site. I hadn't thought about making my own jerky. I think that is an interesting way to prepare steaks, but I would much rather make a more tempting recipe. LaCense Beef has some great recipes, as well as high quality, delicious, mail order, grass fed beef.Though I do work for them, they honestly offer everything you need to make a really great meal. I highly recommend them. I make jerky all the time, but I have never used ground beef. I use organic beef, and usually choose an inside or outside round cut. I slice the meat while it is still semi-frozen into very thin slices. I layer the slices in a container alternating layers with my marinade. I usually leave the meat and marinade in the fridge for 48 hours. When I'm ready to dehydrate, I pat the excess marinade off of the meat and lay the slices on the dehydrator trays. It usually takes about 8 hours in the dehydrator, but I watch it carefully and remove each piece when it's the consistency I like. (You can use the oven if you don't have a dehydrator.) Depending on the taste I am looking to make, I choose marinade ingredients such as soy sauce or worcestershire sauce, garlic or garlic salt, ginger, onion salt, black pepper, liquid smoke, sugar free maple syrup or brown sugar splenda, red pepper flakes – whatever taste sensation you desire. I mix up the marinade beforehand and taste it as I go. The trick is to use 1 tsp of salt for each pound of meat to reduce bacterial growth while drying. Been making Jerky for over 30 years! I make mine like Dee does. You really need to consider that most of the marinade liquids don’t actually make it to the final product. I still will measure what I use for carb count but then look at what is left in the way of soy sauce, smoke, etc and recalculate. I am on insulin and keep super tight control so I am really good at recalculating! I also use round steaks or flanks. Tried burger meat once and didn’t care for it. Deer is nice but I don’t get offered it much. I'm no expert but i think 160 is only required when you are cooking a burger in the normal way (and if you dont care that you are ruining your burger). Pathogens are killed as a function of 1)heat and 2) time. Dehyrating takes a long time, so 160 ought to be plenty of heat over five plus hours to remove any and all nasties in your meat. You would probably be safe at much lower temps-but of course that just mean it would take longer to dehydrate. It’s really more of a gun. I am not shilling for the KMart; it was an easy image grab. I cook mine in the oven at 200 with the door cracked overnight. Has always come out perfect and I’ve never gotten sick. HOWEVER – I usually use venison and my marinade is wet – so there is a difference. I post cook to kill any baddies — this is what the dehydrator i use told me to do.. 10 mins in the oven on 275. Didn’t seem to dry out the jerky any further, and I’m still alive!